The diversity of information in the public transportation is huge. A passenger who wants to travel today from point A to point B has to spend a lot of time in order to recognize the relevant information from the different travel schedules, which are sometimes difficult to read. This process can be confusing for the users who are traveling to a specific destination. Recognizing the time and place where the passengers should go to catch the convenient vehicle can be very difficult and frustrating. The modern information systems are designed to solve this problem. These systems require installation of LED static displays on the important public transportation stations. These stationary displays provide passengers with the information about the next vehicle arrivals in a clearly readable format. These dynamic lists can optionally show schedule of arrival and departure and thus facilitate the passengers to choose the next desired destinations. 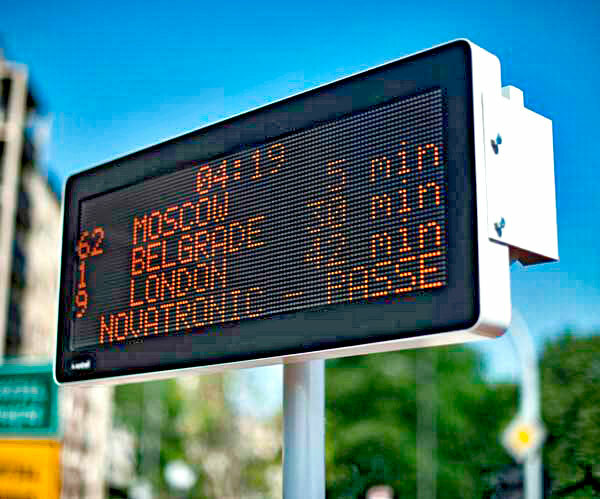 „Novatronic“ stationary displays are, above all, designed for informing the passengers. They can be placed next to bus stops, airports, railway stations… LED display for stations have an extremely long life cycle. The sensors register the level of ambient light and temperature and according to that parameters displays regulate the level of brightness, thereby achieving savings in consumption. Moreover, displays increase durability as well as a clear visibility in all weather conditions. Control of devices on stations can be through a wired, LAN or wireless communication. There is the possibility of using different types of interface communication, such as RS232, RS485 Ethernet, GPRS, WiFi. „Novatronic“ provides system integrators with API and clearly documented communication protocols.